Truth be told, Chuunibyou Demo Koi Gai Shitai! was the very first Anime I ever watched as it was airing. Looking back over an old Facebook account I was absolutely gushing over it right up until the very last episode where I suddenly soured on the series. You see, at the time it was airing I had just separated from the Brony fandom entirely and could only think of the shame of all the times I committed social suicide when looking back. I was outraged that the series ended with Rikka continuing to be a chuunibyou because I saw that as encouraging her social ineptitude. You might say I was a bit like Yuuta in my fear of that behaviour. Eventually I became open to the idea that my reading of Chuunibyou’s messages was a bit lacking, and when that thought got mixed with a nostalgic desire to look back on the series just half an hour or so ago I went through my folders and found the first episode as soon as I could, and boy am I glad I gave Chuunibyou another chance. 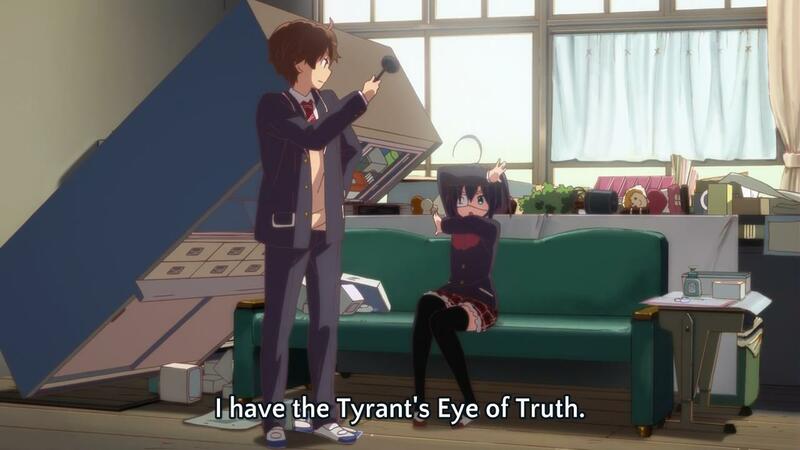 Chuunibyou is absolutely brimming with rich subtle character moments. The very first scene of the series depicts Rikka’s first interaction with Yuuta, wherein she climbs down a rope from her apartment just above, stumbling only for Yuuta to catch her tiny feet in his hands. Yuuta looks up at Rikka standing atop the balcony as if she were an almost godlike figure, with the full moon glowing in the background amongst a dreamy subdued colour palette. After cryptically asking Yuuta “Do you want to see?” (which Yuuta initially mistaked for something more perverted than mysterious), a long distance shot is taken of her awkwardly climbing down the rope, at which point Yuuta finally realises that she’s not some mysterious being but merely a chuunibyou. This little scene is a wonderful quirky blend of whimsical and slightly blunt, which is exactly what Chuunibyou excels at being. Only a studio like Kyoto Animation could carry out such a gorgeous little piece of characterisation. From then onward we get scene after scene of little character moments that bring Yuuta and Rikka together at the center of the narrative. The next scene between the two comes at the train station (wherein there’s also another nice subtle character moment where Yuuta and Nibutani, both former chuunibyous, go to look in the mirror at the same time to make sure they look “normal” for their first day of High School), during which Rikka attempts to show off her so-called powers to Yuuta by pretending to open the train’s doors, which Yuuta hilariously falls for initially as Rikka smugly struts onto the train. 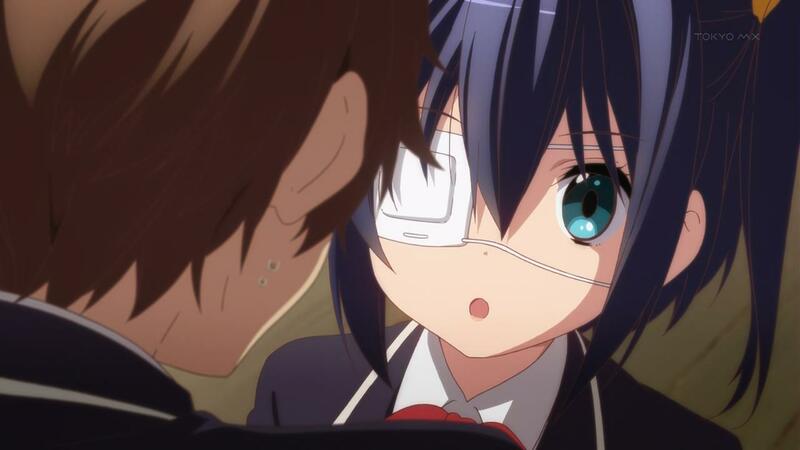 Even more humorous scenes with little pieces of underlying characterisation follow, all establishing Rikka’s chuunibyou delusions as well as Yuuta’s failed attempts to subdue his own chuunibyou delusions. Yuuta inadvertently taps into his inner Chuunibyou while he stands on a classroom balcony telling himself to act normal, followed by the shot zooming out to show Rikka watching him. Rikka goes up to Yuuta in the middle of the class and babbles on with her chuunibyou nonsense as Yuuta looks on in fear of what he’s trying to hide about himself. In the next scene we get to see the first proper interaction with Yuuta and Rikka in the nurse’s room. 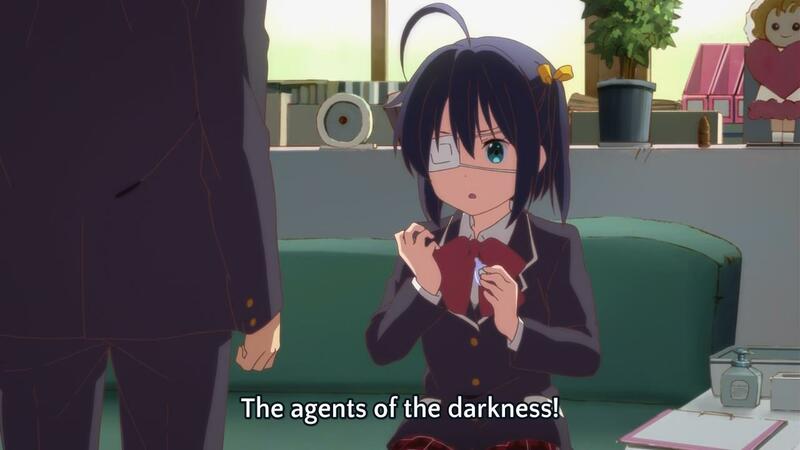 First of all we see how Rikka justifies her childish fears with convoluted excuses related to her chuunibyou delusion when she has to take her eyedrops. 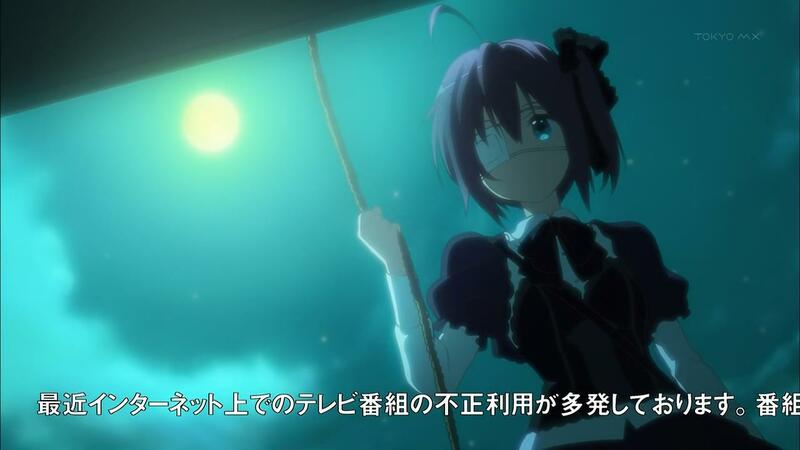 Next we see how Yuuta drifts in an out his chuunibyou-ness when we go from a goofy distanced shot of Rikka posing and talking about her fantasy powers followed almost immediately by ominous dark fantasy music and intense closeups on Rikka as she reveals what’s underneath her eyepatch (as pictured above), followed by Yuuta being snapped back into reality by Rikka stumbling and dropping the contact lens that she used to make her eye glow. Later on Yuuta attempts to be “normal” by going out to socialise with his peers, but ultimately gets stuck having to take Rikka home because she lost her wallet. Yuuta isn’t able to grow beyond his chuunibyou-ness because he’s unable to accept that it’s within him, and thus in staying with Rikka he’s forced to deal with that fact. After another scene at the train station with some more solid gags of Rikka being adorably chuunibyou and Yuuta being the foil we get a serious moment of characterisation to finish off the episode. After helping Rikka unpack her belongings in her new apartment, Yuuta goes to throw away his old chuunibyou possessions. He tells Rikka that their chuunibyou fantasies aren’t real, to which Rikka replies that they are real and urges him not to throw away those possessions. Yuuta looks on at Rikka’s glum face and feels guilty, not only for making her sad but also out of his subconscious realisation that he shouldn’t have turned his back in shame on his past behaviours. He decides to keep them, using the excuse that it would be better to sell of the items. It’s only a baby step, but it’s a step in the right direction. And thus Chuunibyou Demo Koi Ga Shitai! and the tale of Rikka and Yuuta coming to terms with their teenage delusions begins! Looking back on it, Chuunibyou episode 1 really was something. 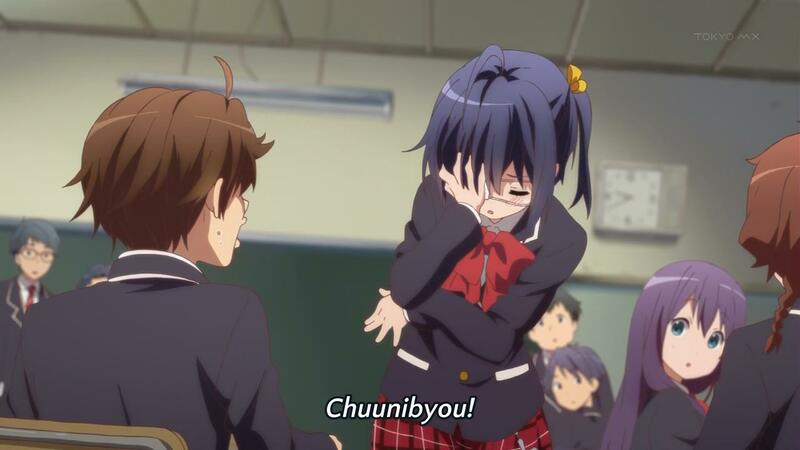 From this episode alone I can say that Chuunibyou has some of the absolute best character moments of any Kyoto Animation series, which is saying a whole lot. These are all little scenes that don’t stand out as phenomenal characterisation on their own, but when pieced together elegantly they create something real special just as they do right here. Topped off with KyoAni’s consistently stellar directing and animation and all around tight graceful writing and you get a real great series in this. Chuunibyou Demo Koi Ga Shitai! well and truly deserves another full watch and a second opinion from me, and I’m going to give it that. 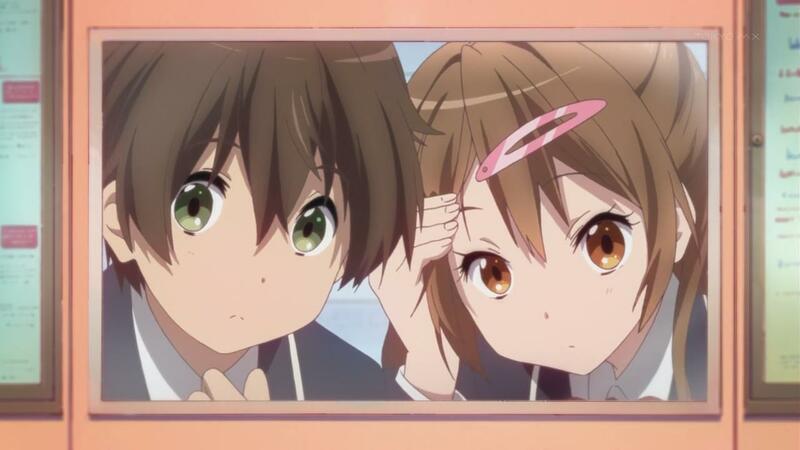 Posted in Analysis, Anime, Episode Analysis	Chuunibyou Demo Koi Ga Shitai!